Using the Lord's name in vain. It's more subtle than you might think. It's more serious than a few choice exclamations that spew from our mouths or from the movie or television screen. Using the Lord's name in vain is about attaching His Name to something that He wouldn't. Why is the Lord's name so important? It's because His name describes His nature and character. When the Lord told Moses, "I AM THAT I AM," He was saying that for every hurt, for every need, for every joy, for every sorrow, He is enough. Why would we want to cheapen His nature and character by stamping the name of Jesus on a copper and magnet bracelet. The obvious reason is for personal gain. The advertiser is using the fact that our God is Adonai Rophe (The LORD our Healer) to make some money. Aren't there other ways we misuse the Lord's name? How about false prophecy? "The Lord said..." or "God told me" or "God gave me this (song/needlepoint/underwater woven basket)". Do I believe God still speaks? Absolutely! He speaks in accordance with the Scripture and in accordance with His nature and character. I don't believe that God writes bad songs. The book of Psalms is proof of that. However there are some terrible songs floating around out there that God supposedly gave someone. We use this God cloak as a defense mechanism. We want to believe that invoking God's name elevates our idea, our song, our needlepoint above scrutiny. I believe that God gives us talent and creativity to use for His glory. Let's take ownership of our crafts and not try to blame God for our bad art. "I'm a Christian plumber." I believe that identifying yourself as a Christian plumber, or carpenter, or mechanic, or lawyer is another subtle way of using the Lord's name in vain. It is meant to give your potential customer some sense of comfort knowing that a Jesus-approved professional is coming to their aid. Unfortunately, many so-called Christian professionals are careless at their jobs and have misrepresented the character of the One they supposedly represent. Just be excellent at your job, whatever it is, and use the respect you earn as an avenue to share the gospel. There are many more subtle ways that we use the Lord's name in vain. I've only listed the ones that I'm not personally guilty of. That, my friends, was a joke. Over to you: In what other ways (whether blatant or subtle) do we misuse the Lord's name? Discuss amongst yourselves. Hey, Toby! It's Ann. Lee and I were in Clarita, OK a couple of weeks ago at a big craft show. The booth right next to ours was a music minister from a church near OK City. 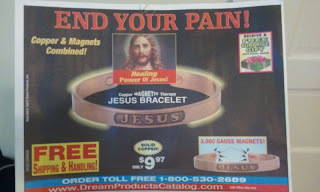 He and his wife were hawking the benefits of a "tuning bracelet", to put your body back in tune and take away pain. I was amazed as I watched many people hand over their credit/debit cards to be charged $165. Almost every time a sale was made they would say "We're not in it for the money, we just want to help people". I did not hear them sharing the gospel or introducing the Great Healer to any of these people as they took their money. WOW! That's scary stuff. Thanks for writing. Let's get together sometime soon. We miss you guys.